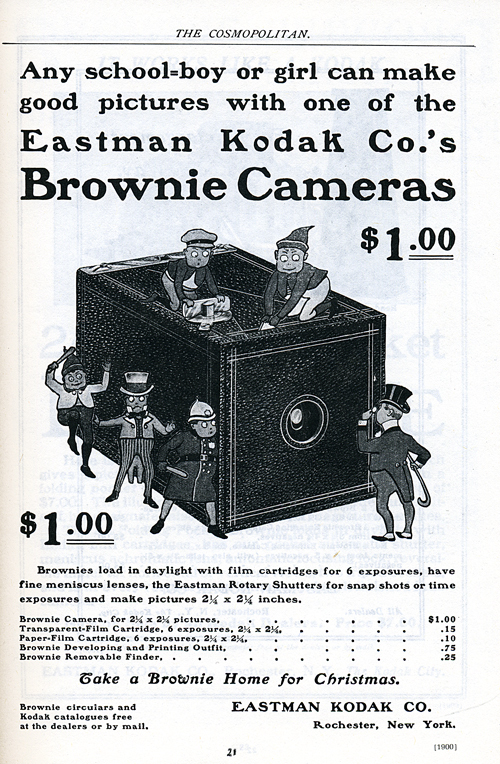 It seems as if photography has come full circle since George Eastman invented the easy-to-use Brownie camera at the end of the 19th century in which all you had to do was press the button, send the camera to Kodak and they would do all the rest, including printing the pictures and putting a fresh roll of film back in the camera. And now we have lens-based telephones and digital devices that can capture and transmit photographic images anywhere in the world within seconds. But why photography? What’s the appeal? With photography’s powerful descriptive nature, the possibilities of visual engagement can begin to suggest the interpretive meanings of one’s curiosities and ideas similar to other forms of personal expression. A photograph provides for that sensation of visual immediacy and clarity. Consider the proliferation of lens-based images in contemporary society with tabloids, newspapers and magazines, television, film, the Internet and mobile communications. The world today has been conditioned, overwhelmingly, to visualize. The “picture” has almost replaced the “word” as a means of communication. It almost seems that the existence of the word is threatened. The picture is one of the principal mediums of interpretation, and its importance is thus growing ever vaster. – Bernice Abbott, Photography At The Crossroads, 1951 (magazine article) from The Education of A Photographer. But what does this mean for the young artist/photographer attempting to develop their own sense of photographic vision and creative visual expression. Where do you start? It becomes necessary to define what role and function the photographic image will serve for oneself as well as what each individual photographer will contribute towards the medium. How does the photographer identify their subject matter? 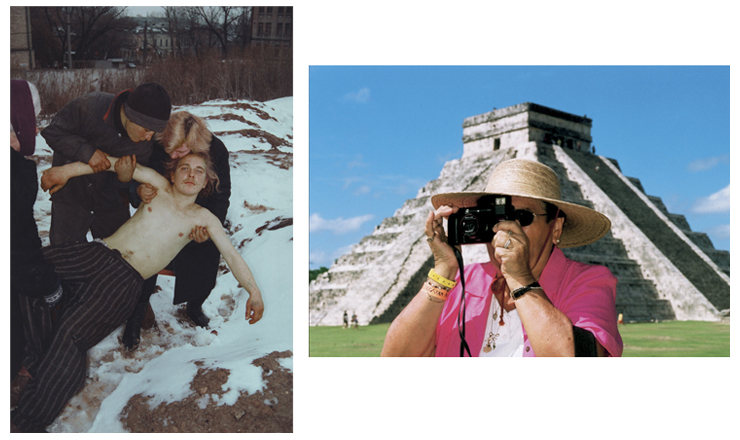 What is the process the artist/photographer will need to engage in to determine what he/she should/needs to photograph? Once the photographer has identified their subject matter in combination with their own sense of vision, aesthetic approach and technical execution, it becomes necessary to establish a plan to develop and produce work that challenges this subject matter visually, intellectually, emotionally and/or technically. How does the photographer challenge these considerations and progress so that the work continues to be engaging and vital without becoming static and repetitive? When does the photographer know or realize that he/she has exhausted all conceptual possibilities in relationship to their sense of photographic vision? One photograph is made, suggesting a particular voice, vision and approach, which leads to another photograph and so forth. Once the artist has identified their subject matter in combination with their own sense of vision, aesthetic approach and technical execution, it becomes necessary to develop and produce work that not only challenges this subject matter visually, intellectually and emotionally, but can be sustained over the long haul. The road ahead can be challenging and difficult, and it is vital to artist’s survival to work through not only the engaging efforts, but more importantly, the obstacles and temporary setbacks, whether they be conceptual, visual and/or technical. How does the artist persevere so that the working process can be sustained in such a manner so the work doesn’t become static and repetitive? When does the artist know or realize that he/she has exhausted all conceptual possibilities in relationship to their sense of photographic vision? It seems necessary for the artist to develop a strong and enduring sense of perseverance and commitment to their idea through continuous and engaged practice over a long period. This requires a determined continuation with conceptual development and visual pursuits in a steady and continued manner, especially in spite difficulties or setbacks. Shoot images that reflect focused attention on your curiosities and interests through your photographic vision and sense of technical execution and craftsmanship in preparation of developing a conceptually cohesive portfolio of photographs for the final project. It is essential that your idea(s) reflect a sense of considered thought, active visual exploration and is articulated with a cohesive vision and voice. In considering your photographic vision and use of camera aesthetics, give particular attention to your use of the photographic frame, vantage point, moments of exposure and the role and use of light to reveal your interpretation of the thing itself and details, as well as materials (black & white and/or color) and processes (analog, digital and/or alternative/hybrid process). Consider various visual strategies and points of view, including the possibilities within a single frame, multiple-image sequences and series, and the juxtaposition of images (diptychs and triptychs). Using the feedback and discussion from the first critique, continue to shoot images that reflect more-focused attention on a body of conceptually cohesive photographs in preparation for the final photographic portfolio. At this stage of your conceptual development, it is essential and necessary that your idea(s) reflect a sense of considered thought, active visual exploration and is articulated with a cohesive vision and voice. Despite difficulties and setbacks you may be experiencing in expanding the conceptual possibilities with the work, with your use of the camera and/or technical concerns, it is vitally important to push through these complications in order to fully realize the possibility of your idea. For each of the three critiques, students will present their work in groups (2 – 3 students) per class on their schedule critique date.